Stem succulents don't have leaves. Cacti are stem succulents, but they are not the only ones. 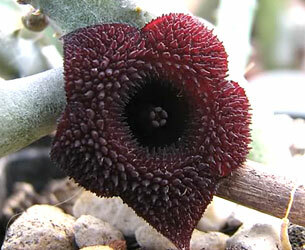 This is a stapeliad. You can see the green stems behind the flower. 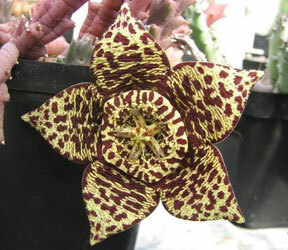 The stapeliads are a large family of plants. They grow in dry areas all over Africa. Take a look at the flower. 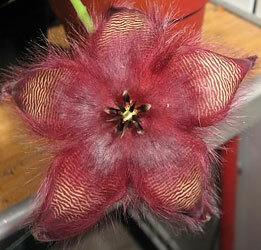 Many stapeliads have amazing flowers, but they all have five points, like a star. 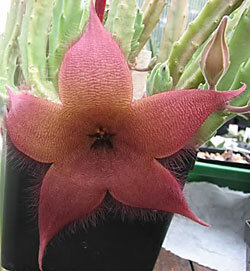 Stapeliads are famous for the scent of their flowers. What's the nicest flower scent you know? Well it's nothing like a stapeliad! Many of the flowers smell of rotting meat. Horrible to us, but very tasty to flies which are attracted to the flowers and pollinate them. 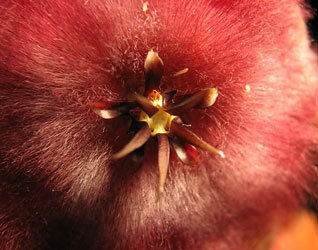 Some stapeliad flowers can be hairy. Take a look at the pictures below. The hairs are soft and silky to touch.